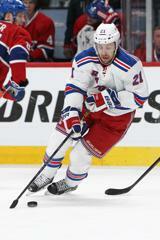 Stepan has been outstanding for the Rangers through the playoffs. The 23-year-old has 13 points in 18 playoff games, tied for the team lead with Martin St. Louis. He's notched five goals and eight assists, including an impressive two-goal showing against Montreal on Tuesday in Game 5 -- just days after having surgery to repair a broken jaw suffered in Game 3. 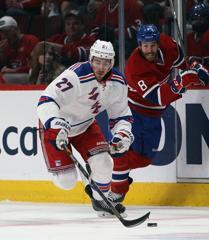 There's no doubt Stepan's prowess is a big reason that New York leads the Habs 3-2. The series goes back to Madison Square Garden for Game 6 on Thursday, May 29. Like his Minnesotan teammate, McDonagh has been a force for the boys in blue. 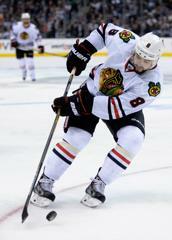 The defenseman has 12 points in 19 games and tallied a four-point game on May 17. That puts him just behind Stepan and St. Louis in the stat column. We bet Montreal -- who originally drafted McDonagh with the 12th overall pick in 2007 -- wishes they hadn't traded his rights to New York right about now. Leddy has quietly made his prescence known, pushing past his hometown Minnesota Wild in the second round to help Chicago advance to the current Western Conference Finals against the L.A. Kings. A sturdy defeseman, he's put up five points through 15 games in the playoffs. Though limited on shots, the 23-year-old former Golden Gopher recorded just his second, pro-career playoff-goal on May 21. Despite the Blackhawks speed and power offense, Leddy and his squad are down 3-1 in the series, with Game 5 tonight at 7 p.m.